UTT Throwback Thursday: Where Does a Muslim Soldier’s Loyalty Lie? 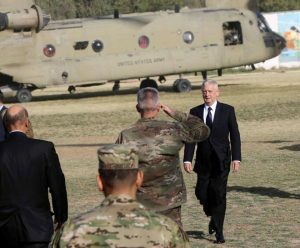 NBC is reporting the Taliban targeted Secretary of Defense James Mattis in an attempt to kill him during his surprise visit to Kabul yesterday. Taliban leaders credit Afghan security forces with tipping them off. With the number of attacks on U.S. forces by Afghani police and military working with our forces, this should not be surprising. What is surprising is that in 16 years since 9/11, there has not been one military leader who has called for us to vanquish the enemy at home and abroad and win the war as the United States. Our leaders feel the unending need to incorporate muslims into the plan. So far it cost us the wars in Afghanistan and Iraq, and is costing us the global war against the Islamic Movement. 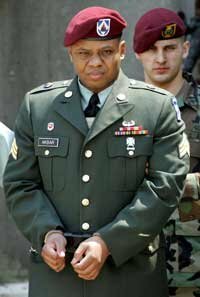 On March 23, 2003, U.S. Army Sergeant threw grenades and fired his weapon against other U.S. Army personnel at a 101st Airborne Division position in Kuwait during the early part of the war in Iraq, killing 2 and wounding 14. Of course the Army said Akbar was “mentally ill” and did what he did out of resentment for how he was treated. The muslim soldier’s diary contradicts that assessment. Our enemy calls itself the Islamic Movement. It is made up of: violent jihadi organizations like Al Qaeda, the Islamic State, and many others; Muslim Brotherhood organizations (suit-wearing jihadis) who control the narrative and conduct the call to Islam (dawa); and the Islamic nation-states, all (57) of which call for sharia to be the law of the land on the planet. Sergeant Akbar’s killed U.S. Army soldiers because Islam commands it. Saudi Arabia calls for sharia across the globe because Islam commands it. The U.S. Muslim Brotherhood (ISNA, CAIR, MSA, MAS, ICNA, MPAC, et al) works daily to overthrow the U.S. government in order to establish an Islamic State under sharia because Islam commands it. Sixteen years after 9/11 and American leaders have still not done what U.S. warfighting doctrine requires – identify the enemy. John Guandolo is a great ally to America when it comes to dealing with the ignoble ideology that is Islam. Listen to him and you’ll understand the corrupt Muslim mindset. Thank you sir. Greatly appreciate the support. The UTT team is in battle daily. We need supporting arms. Speaking truth is the beginning. leaders who lead them down this narrowing road.that islam is peaceful no connection to jihad..then the muslim brotherhood will effectively be exposed…if that day comes. We kill islamic terrorists, but give islam protected status. We are a special kind of stupid. America’s military brass know they’re not loyal to the US ~ there’s 0 chance they don’t. Our officials have access to the best intelligence on the planet, the best think tanks, yet this escapes them? No, it does not. Just like our “officials” in DC know they’re not only not loyal, they’ll kill Americans. Just as Islamic citizens will kill Americans. The ball has been in the people’s Court for since at least 9/11. There’s no excuse not to learn about Islam after that day. Then we have a U.S. Constitution carrying, NeverTrump, Muslim father who still doesn’t realize his kid was killed by a ‘Radical Muslim Terrorist’ – Khizr Khan, lawyer for Crooked.